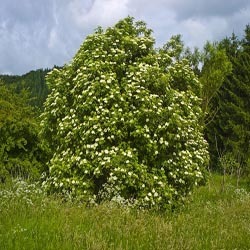 European elder is also known as black elder, elder, elderflower and sambucus. Elder is indigenous to Europe, Africa and some areas of Asia. It can grow in a range of conditions dry and wet fertile soils, mainly in sunny areas. The berries as well as the flowers of the elder have been used for swelling, pain, infections, skin conditions, and coughs. Today elderflower and elderberry are used for fevers, sinus infections, constipation, flu and colds. In Ukraine and Russia, drugstores sell Elderberry flowers to relieve congestion. The elderflowers and the elderberries of the elder tree are used to make teas, capsules, and liquid extracts. In Europe the dried flowers are used to create a cordial or syrup. The cordial or syrup is diluted with water first before drinking. In Germany and Scandinavia, soup is created from the elderberry. In some laboratory studies elder has been shown to reduce extreme sinus mucus secretion in animals. There is limited research using elder as treatment for sinusitis in humans. Combination products that contain elder as well as other herbs have been discovered to have helpful effects when it is used with some antibiotics to treat infections in the sinuses. There still needs to be more research in this area. Some of the studies indicate that herbal preparations, which contain elder, result in the mucus membranes swelling less, milder headache, decreased nasal congestion, as well as better drainage. Unripe or uncooked elderberries can cause nausea, severe diarrhea, as well as vomiting and are toxic. Only the black/blue berries of the elder are edible. Elder might have urine producing effects, so with that in mind, exercise caution if using elder with urine increasing drugs.